My jaw has dropped on more than one occasion in the past month as I’ve read about some of the uninformed conversations media leaders (and industry outsiders) have been having about the future of news organizations. Conversations about changing fair use doctrine and copyright law, charging for content and disabling search engines are being lead by people who don’t seem to understand the new economics of media. It’s not the conversations about paid content that bother me. These ideas are not new. They are very old ideas that have been tested and failed. They will fail again and then go away as will the World Association of Newpaper’s Associated Content Access Protocol proposal. You can read the analysis of this topic by people more eloquent than me here, here, here, here, and here. It’s the conversations about fair use and copyright that scare the hell out of me. “Unjust enrichment theory in common-law unfair-competitor contexts would entitle the originator of news reports to two kinds of remedies against competing parasitic aggregators if the originator chose to enforce its common-law rights. One would be to require those aggregators to disgorge revenues received from advertising associated with the substance f the originator’s new reports. I love the word “disgorge” in the first paragraph. As if anyone but Google is gorging on online ad revenues. But is doesn’t stop with changing copyright law. 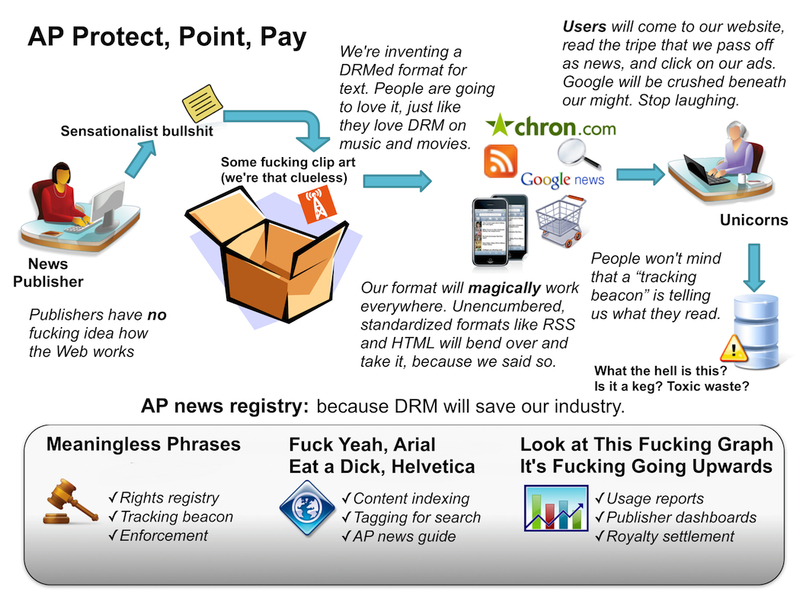 Now AP has proposed a type of DRM system for news content – a mysterious “wrapper technology”. To be honest, I don’t even understand what they are trying to achieve. There are conflicting views even from within the AP with President Tom Curley stating that a licensing agreement will be required for use of even small amounts of content such as links and headlines and Jane Seagrave, AP’s Sr. VP of global product development saying it is only for full text content. Either way, when I viewed the AP’s explanatory illustration with Tim Quinn, my Director of Site Operations, we were both left scratching our heads as to how this could even be implemented. Some have likened it to “magic beans” and the folks at reddit.com had a great time creating their own version. Each of these proposals requires the Internet to stop being the Internet – as in an interconnected network – and reveals a woeful lack of understanding of how value is created online. 1. It shows a lack of understanding of what is scarce and what is abundant. The Marburgers make a flawed assumption that “parasitic” online news aggregators have the ability to drive down the CPMs charged by traditional media news sites. For this to be true, advertisers would have to be deciding between placing ads either on an aggregator site or a traditional news site and no other sites. They would have to ignore the billions of annual ad impressions on pure-play content sites, blogs, forums and social networking sites. We would also have to ignore the fact that a substantial proportion of online advertisements are placed through ad networks, both premium and remnant, where advertisers are buying a channel rather than specific site brands. There is simply too much inventory available for us to determine that one site is having a direct impact on another site’s CPMs, especially at the national level. Ironically, Google is considered a “pure aggregator” and therefore “economically good for originators of news”. If you want to determine who is driving CPM advertising rates down, look no further than Google and its CPC marketplace. 2. There is no way to quantify the actual economic impact of the “parasitic aggregators”. CJR reports that Jane Seagrave of AP estimates it to be “tens or hundreds of millions” of dollars, but doesn’t elaborate on how she’s arrived at that number. The Marburgers state that “Changing the law to prevent the free riders’ unjust enrichment should boost the market rate for online advertising associated with daily news reports to a level that covers the costs of using large staffs of journalists to produce them, plus a modest profit. Based on what? They also refer to the Daily Beast and Newser as two of the “parasitic aggregation sites” that are driving ad rates down. The thing is, neither of those sites currently sell advertising. And what about advertisers such as Purina who are creating their own sites using aggregation? They’re good because they are “pure aggregators”, but they are bad because now they don’t need to advertise on the traditional media site. As soon as you stick your finger in one hole, another leak springs somewhere else. 3. It assumes that the commercial life of a news report is “usually about a day”. Ever heard of the Long-tail? 4. It assumes that the old model of being a closed, dominant portal is the only model for creating value and funding quality newsgathering. The Marburgers refer to a 1942 article published in the Harvard Law Review by Rudolf Callmann who predicted the destructive effect of free riding on newsgathering. I’ll refer to the 2005 PowerPoint by economist and Harvardbusiness.org blogger Umair Haque, who states that value is now created by being open to aggregators, micro-platforms and re-constructors. Being open provides economies in distribution, coordination and production that enable the popularity of content to grow. Haque believes that failing to understand this will be the single biggest cause of fatal strategic errors committed by mass media companies. 5. It assumes that all online advertising is IAB standard positions sold on a CPM basis. I can testify from my experience with my own sites that increasingly, advertisers are asking for custom integration, page take-overs, tool sponsorship, advertorial sections, etc. It’s no longer based solely on driving page views. Context, environment and engagement are becoming increasingly important. 6. It focuses on newspaper websites as solely about creating breaking news content and completely ignores the other things we are and should be doing to add value. We should be at the centre of our communities. See Steve Buttry’s blueprint for the complete community connection here. We should be partnering with local advertisers and seeking ways to drive ROI for their advertising dollars. We should be creating vertical niche content sites. We should be providing news, information, context around long-running stories, data, listings, events, advertising, flyers, coupons, maps, etc. See Mark Pott’s excellent checklist here. 7. It assumes newspaper websites cannot become aggregators themselves. This is ridiculous. In fact, news websites must become aggregators if they are going to survive. There is no need to re-create content that exists on other sites, we should be linking to it. We should be creating local networks and selling advertising for local bloggers. The Miami Herald’s South Florida Blogs and the Tribune’s Chicago Now are excellent examples of how newspapers can help drive traffic to the local blogging community. 8. It assumes that only print media companies can create quality news reporting and opinion. Of course, we know this is already being proven wrong. Countless authors, scientists, professors and other experts have created global brands for themselves producing high-quality original content on their blogs. Globalpost.com, the Huffingtonpost’s new investigative fund, spot.us are all experimenting with creating original news content without a traditional newsroom. This leaves me frustrated. We’re wasting time. Rather than trying to figure out how we can restore the industry to where it was ten or fifteen years ago, we should be planning for the role we will play in this new world. Rather than trying to figure out ways to stop users and content producers from linking and connecting and discussing and collaborating, we should be figuring out how we can enable them. Rather than looking to users to pay for content to make up for our revenue declines, we should be figuring out how to help our advertisers navigate this new world of media by focusing on delivering return on their investment with us. So I have to ask a question. Can the disrupted manage their own disruption? In this brilliant analysis, Michael Nielsen suggests that the answer is no. He believes that “organizational immune systems” prevent us from doing what needs to be done to save the industry and that true innovation would require us to be so radical in our decision-making, our executive teams would get fired. I’m not quite so pessimistic, but I do think it will require news media executives to focus on where we can provide value in the new media economy, not on how we can protect what was and will never be again. This new economy requires radically different product strategies: letting the outside in, curation rather than ownership, becoming a part of an ecosystem, moving from mass to vertical content and viewing the site as a service instead of a product. The blogosphere is full of potential solutions for media companies to explore. Here is a vision from Xark! of what the next 11 years might look like as we migrate to the new media world. I’m lucky. At the Star, we are starting to have these conversations about our future in Media 2.0, but it can’t just happen in small, isolated pockets. There needs to be industry-wide thought devoted to these issues. After listening to Marburger on this week's On The Media (http://www.onthemedia.org/transcripts/2009/07/24/05) I can only say he doesn't understand that he doesn't understand. For better or worse I think the reality of suggestions/white papers/post such as those by Judge Richard Posner the Marburgers does nothing more than proclaim their irrelevancy and ignorance. To use a historical analogy they are simply King Canute (http://en.wikipedia.org/wiki/Cnut_the_Great), not only commanding the tide not to wet his feet, but marshalling their troops to enforce their command. The number of troops and their prowess is meaningless in the face of the tide. The outcome of the changes is completely independent of the efforts of such people. Changing the laws will actually make the final outcome more painful for a greater number of traditional organisations as they will feel a false sense of security that will ultimately prove fatal. I agree that content providers have a hysterical approach to fair use, and have consciously or done profoundly misinformed the public. Some guidance on fair use can be found at our website, centerforsocialmedia.org/fairuse. Excellent Codes of Best Practices are there, which show how fair use is reliably being employed by a wide variety of creator and user communities. These codes are vetted by a bank of lawyers, and have the stamp of approval of perhaps the most conservative of all industry actors: the insurers (for errors and omissions in film).